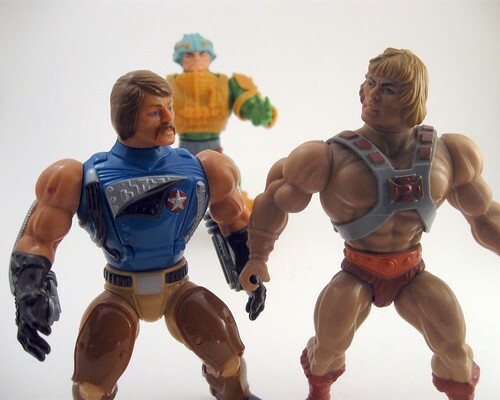 He-Man and the Masters of the Universe might be historically significant in the world of toys but it just couldn’t compete against its contemporaries. Growing up the 1980s, mine was one of the first generations to have near unlimited options when it came to franchise toys, games and cartoons. That decade lays claim to some of the most iconic toy franchises in history, including Transformers, GI Joe, Teenage Mutant Ninja Turtles and, of course, He-Man and his little sister, She-Ra. Being surrounded by so many choices, all you could do as a kid was pick the one that had the coolest toys and the best cartoon, and that formula didn’t prove fruitful for He-Man. However, Masters of the Universe deserves some credit from a historical stand point. He-Man and Skeletor in their prime. 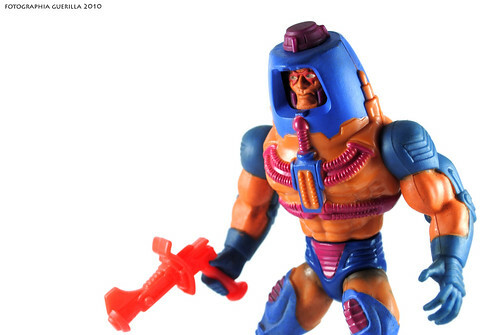 We all owe the He-Man a lot when it comes to toys and cartoons. Masters of the Universe was one of the first cartoons that was produced pretty much for the sole purpose of selling toys to children. Some parental organizations took exception and called foul but we all know how that debate ended. Surprisingly enough, the reason many cartoons from that era had have the now famous PSAs was as a compromise with those groups. In the end, however, without the He-Man cartoon we wouldn’t have been blessed with the likes of Transformers or GI Joe or any of the countless other cartoons from that time…and without the cartoons there would be no toys. See this kid. That's not me. It's Screech showing off his He-Man love. I was not a fan of He-Man as a kid and that’s because neither the toys, nor the cartoon, were that appealing. I surrounded myself with GI Joes and Transfomers while my best friend next door had a toy chest full of He-Man stuff. 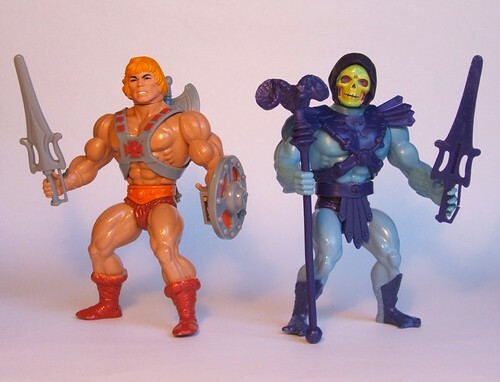 I had a few He-Man figures that I received as gifts but they never got much play time because they just weren’t that cool. More often than not, my He-Man figures were portrayed as the evil giants in GI Joe land, partially due to their formidable size in comparison, but also due to their fantasy theme. I’m sorry but in a cage match between giant robots and a barbarian, the robots win hands down. And let’s say that if He-Man managed to survive a chair shot from Optimus Prime, Duke and the rest of the GI Joes would have swooped in and cleaned up the pieces left behind. But He-Man did corner the market on well-sculpted mustaches. Lets look at some of the obvious reasons why He-Man was a less than impressive action figure. First off, He-Man doesn’t have many joints and thus couldn’t really be put in many poses. Prince Adam and his buddies could only move their arms in one direction and only at the shoulder. They also didn’t have any knees to speak off, and they could only twist at the waist. So if you wanted Skeletor to kneel or even sit at the table like a good evil lord, he couldn’t do it. He-Man figures just weren’t as versatile as say, GI Joe figures, nor were they as well sculpted. With such limited movement, your own adventures in Eternia were stuck being wrestling matches. Of course, wrestling matches made sense because the figures were pretty big, so it was hard to have them play well with other action figures. Masters of the Universe also featured some of the weirdest characters that looked as good as they also confused. It seems that unless you were He-Man or Man-At-Arms, you were some crazy, hideous mutant with bizarre powers that weren’t really useful, even in fantasy land. For example, Mekaneck, whose awesome superpower was…a long neck. Yeah, that’s who I want in a fight, giraffe man. And who can forget Mantenna? His ability to make his eyes bug out most certainly struck fear into the hearts of men all around the universe. Even though He-Man’s cronies were ridiculous and unfun, several of them do deserve credit playing with our senses in ways that other figures did not. Figures like Moss Man and Stinkor not only gave our fingers something new to touch, but they also attacked our sense of smell…and Stinkor was a character that really earned his name, PU! Man-E-Faces was one of the better figures but still big and inflexible. Masters of the Universe did have some interesting vehicles, albeit few, but they were also quite ugly and otherwise unusable. Especially when you look at what GI Joe offered in terms of accessories and playsets, He-Man just doesn’t stand a chance. The Transformers had little in the way of accessories and vehicles…but wait…oh yeah, they were the accessories and vehicles! You could probably argue that Prince Adam “transformed” into He-Man, but to make that happen you had to buy both figures, so when it comes to bang for your buck, Transformers are the clear winner. He-Man and the Masters of the Universe was incredibly popular and important for millions of children around the world. The series deserves the utmost respect for ushering in the era of toy-shilling cartoons that is still chugging along today. However, just because you’re the first to do something doesn’t mean you’re the best, and when it came to the action figures and toys, He-Man just couldn’t keep up. I want to thank He-Man for everything he did for us, but when I go into battle, I’ll be teaming up with Transformers and GI Joe. After I wrote this I thought more about why I didn’t get into He-Man. The other half of why has nothing to do with the toys, so I added a few more thoughts over at Morning Toast.